Are entered through doors designed to ensure silence in the area. The temperature is a little higher than in the Welcoming Area making it pleasant to get undressed. The air is dry so that the temperature and air also feels comfortable after a hot sauna bath. Good acoustics and relaxing background music keep discussions private and provide personal space to less social guests. There are separate men’s and women’s dressing rooms and showers. In each, the dressing and shower areas are closely interlinked with no doors separating them. Showers are placed in the path toward the Sauna Area to ensure everyone takes a shower before entering. The use of soaps and shampoos is limited to this area; the showers in the Sauna Area are used for cooling down only. Mirrors are only found in toilets and at the makeup tables. There is a big basket for used towels and sauna garments (which is emptied often enough not to ever get full or unpleasant). A table or shelf, integrated into the wall, is used for water mugs and jugs. 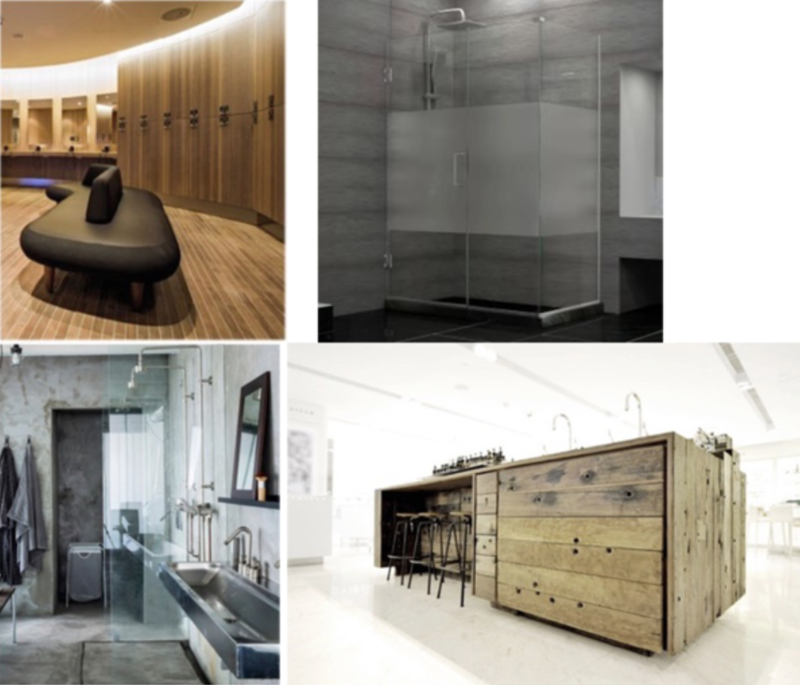 The design provides for more privacy than regular spa or gym dressing rooms (e.g. showers with doors, toilets with soundproofed doors, private changing rooms). We create the feeling of taking a shower outside on a warm summer evening. The floor made of concrete is kept pleasantly warm. The ceiling is as dark as the walls and floor. Windows are not necessarily needed. Water pressure and temperature can be adjusted as guests like. We do our best not to look or feel like a gym, spa or sanatorium – among other things this means that we do not have standard-issue lockers that bring too much visual noise into the room. There are boxes provided that offer both storage space and bench seating. Our guests can use the Lumo Nordic range of toiletries that are available in the dressing and shower areas to no additional cost. These products can also be bought in the sauna shop. The products may be designed exclusively for [Name] or may be offered in close partnership with a brand in line with ours. Guests can, of course, also bring their own toiletries. These can be stored on a shelf, made just for this purpose, close to the showers during sauna bath. Integrated lockers, shower cabinet, outside shower feeling, storage boxes, changing room with privacy.